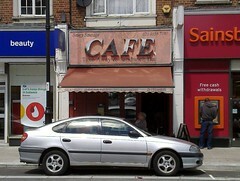 Greasy spoon cafe in Addiscombe, near Addiscombe tram stop. bob visited on a Saturday lunchtime in June 2012. It was quite full when I arrived around noon, but I didn't have to wait for a table. It's quite narrow inside, with normal cafe-style decor, and of the school that chooses not to have the tables and chairs fixed to the floor. I think I remember there being a community noticeboard. There's table service to take your order, but you pay at the counter afterwards. One notable point is that they don't allow any substitutions on the set breakfasts, though you can of course order extras. I went for set breakfast option 1 (egg, bacon, sausage, beans, tomato or mushrooms, hash browns or chips, two toast, and tea or coffee; £5.10) along with an extra order of black pudding (£1) photo. It was all good. The egg was very good, cooked properly with a runny yolk. I was also quite taken with the careful presentation of the sauce packet bowl photo. Last visited by bob, June 2012. Opening hours taken from menu on that visit. Page last edited 2012-07-29 20:33:32 (version 1).